Report on the 1st wine tasting presented by the Sierra Foothills Wine Alliance, held on Sunday, September 19th, 2010 at the Blackhawk Country Club in Danville, California. 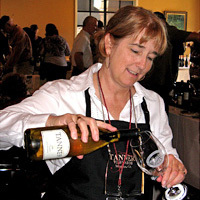 The event featured wineries from all three major Sierra Foothills appellations – Amador, Calaveras, and ElDorado counties. In addition to the tasting itself, there was a silent auction to benefit the Food Bank of Contra Costa and Solano. The “Moving Mountains” tasting was the inaugural event of the new Sierra Foothills Wine Alliance, which comprises of the winery associations of Amador, Calaveras and El Dorado counties. The Alliance was formed to renew collaboration between the various Sierra Foothill appellations. The Alliance will be working to create an interactive website to help consumers better plan their visits to the region. Winegrapes have been grown and wine has been made in the Sierra Foothills, on the western slope of the Sierra Nevada Mountains, since the mid-19th century. Although the broader Sierra Foothills appellation includes grapes grown in eight California counties, three of these form the heart of the wine region and contain the vast majority of wineries in the area – from north to south, they are El Dorado, Amador, and Calaveras counties. Over 5,000 acres of vineyards and 100 wineries, mostly small and family-owned, dot these three counties. This was the very first public event presented by the Sierra Foothills Wine Alliance, and it offered a fine opportunity to taste wines made by many of the best producers from all three major Sierra Foothills appellations at one time. The wineries participating at the tasting – over 40 wineries poured there – represented a good cross-section of producers from the three appellations represented. For a first-time event held during a tough economic climate, the attendance was surprisingly good. The event was well-organized – check-in was easy, and the table arrangement was well laid-out, although it was a little cramped in the smaller of the two rooms used for the tasting. There were plenty of dump buckets available, although offering spit cups as well would be helpful next time. Winery signage could have been better – it was often tough to locate specific winery tables from any distance – although the alphabetical arrangement of all the wineries did help in that matter. Although I didn’t take full advantage of it, the food at the tasting was very good – I tried Greek-style meatballs with yogurt dipping sauce, skewers of various sausages with bell peppers, and some delicious assorted cheeses. There were other tasty-looking food options available as well. From my standpoint, it would have been nice to have had a little more time to taste, although I did notice that the crowd had thinned out considerably by the last half-hour of the tasting. As it was, there were a number of winery tables that I’d hoped to stop at but didn’t make it to – Deaver, Granite Springs, Miraflores, and Twisted Oak among them. The crowd at this event seemed to really be enjoying it, and they were inclined to have longer chats with the winemakers than is usually the case at larger tastings, slowing down the process of getting a pour. Perhaps the tasting could be lengthened from three to four hours in the future. Even with many of the top wineries in the Sierra Foothills pouring at this event, I came in expecting that I’d find pretty variable quality – and although that was true to some extent, overall the quality of wines that I tasted was quite good. I tasted a number of long-time favorites, along with other wineries with which I’d had little or no previous experience. The best of these “new” producers were David Girard from El Dorado and Tanner from Calaveras. A few wines that nearly made the “Favorites” list included Cedarville Viognier and Cabernet Sauvignon, Dillian Primitivo, Il Gioiello Montepulciano, Tanner Viognier, and Terre Rouge DTR Ranch Syrah. Although most wines from the Sierra Foothills are not yet at the quality level of California’s best, there were some at this tasting that really stood out. And because, with few exceptions, the wines from this region are very reasonably-priced, there are some great buys to be found. This collaborative tasting of wines from three different appellations was a great idea, and I’m looking forward to seeing the Sierra Foothills Wine Alliance stage more events like this one in the future. 2007 Semillon, Shenandoah Valley. Light color, displaying ripe pear and stone fruit aromas, along with spice and lees notes. Fairly rich in the mouth, this had a smooth finish. 2006 “Katie’s Côte,”, Shenandoah Valley. 51% Syrah, 49% Grenache. Vibrant, medium purple color, showing blackberry, chocolate, and vanilla/oak on the nose. Medium-bodied but with big, grippy tannins. 2006 Zinfandel, Esola Vineyard, Shenandoah Valley. Medium color, this had bright and brambly plum and blueberry fruit and spicy American Oak aromas. Lively mouthfeel with moderate tannins on the finish. 2007 Aglianico, Shenandoah Valley. Dark color, with an intriguing nose of dark berry fruits, tobacco, earth, and spice. Big but balanced on the palate, it finished with grippy, youthful tannins. Distinctive and quite nice. Comments: I had not tasted Amador Foothill’s wines in many years, and the Zin and Aglianico in particular were quite good. 2008 Marsanne, Calaveras County. Very light straw color, showing mild pear, stone fruit, lees, and oak on the nose. Moderately viscous in the mouth, this had a long finish that brought out the spice component of the wine. 2008 Verdehlo, Alta Mesa. Very light color, with aromas of riper stone fruit, lees, and a touch of spicy oak. Medium-light bodied, with moderate acidity and a smooth finish. 2007 Syrah, Calaveras County. Medium purple color, displaying blackberry, hints of black pepper and mocha, and lots of spice. Medium weight in the mouth, with unobtrusive tannins on the finish. 2007 Cabernet Sauvignon, Calaveras County. Dark color, riper plum and blueberry fruit along with earth and oak notes. Richer mouthfeel, with moderate tannins. Comments: The Bodega del Sur Verdehlo was sourced from the Alta Mesa AVA of Lodi, not far from Calaveras County. 2007 Cabernet Franc, Calaveras County. Dark color, with dark fruits, some herb/tobacco notes, and vanilla/oak. Medium-full bodied on the palate, with fairly smooth tannins. 2007 “High Country Red,” Calaveras County. Equal parts Cabernet Sauvignon, Cabernet Franc, and Merlot. Medium-dark purple color, featuring riper and more intense dark fruit character than the Cab Franc, along with distinct earth and chocolate elements. Bigger mouthfeel with moderate tannins on the finish. Comments: The Brice Station wines are all from their 3,300-foot elevation estate vineyard, one of the highest in Calaveras County. 2008 Viognier, Estate, El Dorado County. Light straw color, displaying minerally stone fruit aromas plus a touch of citrus, along with some background lees notes. Fairly viscous on the palate and a tasty finish, nice. 2008 Grenache, Estate, El Dorado County. 85% Grenache, 15% Syrah. Medium-light ruby color, bright and intense aromatics of cherry and other red fruits, spice, and black pepper. Great acidity gave this a juicy mouthfeel, where a stony minerality also became more pronounced. Not too tannic, with a long and lively finish, very nice. 2008 Zinfandel, Estate, El Dorado County. 92% Zinfandel, 5% Grenache, 3% Petite Sirah. Medium color, lots of ripe (but not jammy) raspberry and boysenberry on the nose, with notes of pepper and oak. Medium-bodied and well-balanced, this finished with moderately grippy tannins. 2007 Syrah, Estate, El Dorado County. 4% co-fermented Viognier. Medium purple color, this had smoky, meaty aromas along with plum and darker berry fruit, pepper, and a strong iron/mineral component. Big but balanced, with good acidity and structure for aging, and medium tannins on the finish, very nice. 2008 Syrah, Estate, El Dorado County. To be released this fall. A bit darker color than the ’07, and showing a slightly darker fruit profile. The aromatics were somewhat muted, and it was showing a little more oak than the ’07, though a similar mineral quality was apparent. The tannins were not surprisingly rougher than the ’07, and this still needs time in bottle to show its best. 2007 Petite Sirah, El Dorado County. Dark color, with ripe dark berry fruit, cocoa, and black pepper on the nose, big and dense in the mouth with chewy tannins. 2008 Petite Sirah, El Dorado County. To be released this fall. Dark color, more minerally than the ’07, with a slightly less ripe profile to the fruit, and a minty note. Another big wine on the palate, but not quite as tannic as the ’07. 2003 Petite Sirah, El Dorado County. Medium-dark color, this showed dark berry fruit, earth/leather, white pepper, and an interesting cola component. Still a mouthfilling wine, though the tannins seemed like they were softening. Interesting to taste this wine with some age on it. 2006 Cabernet Sauvignon, Estate, El Dorado County. Medium-dark color, classic Cabernet plum/cassis aromas, a touch of graphite, some spicy oak in the background and a very minerally streak. The acidity and minerality kept the mouthfeel quite lively, and the finish showed refined tannins. This has become one of the best Cabs from the Sierra Foothills. Comments: Jonathan Lachs pulled out a few "under the table" wines to taste – some upcoming releases and a library wine. Cedarville remains at the top tier of Sierra Foothills wineries for both overall quality and value. 2008 Mourvèdre, “Reserve,” El Dorado County. Medium purple color, mildly earthy plum and raspberry aromas with some herb/tobacco notes. Moderate acidity with a smooth mouthfeel and finish. 2007 “Victorie,” El Dorado County. 40% Syrah, 40% Grenache, 20% Mourvèdre. Medium-dark color, showing darker fruits, chocolate, and spice on the nose. Big and rich on the palate, with a smooth finish. Comments: The winery is located in Camino, in the “Apple Hill” area just east of Placerville in northern El Dorado County. 2008 “Coda Blanc,” Estate, El Dorado County. 45% Roussanne, 21% Rolle, 16% Marsanne, 13% Grenache Blanc, 5% Viognier. Light gold color, displaying minerally tropical fruit aromas, along with a touch of spice. Medium-bodied with crisp acidity and refreshing finish, nice. 2008 Viognier-Roussanne, Estate, El Dorado County. 71% Viognier, 29% Roussanne. Light color, with distinct Viognier floral and peach aromatics plus some leesy notes. More viscous in the mouth than the “Coda Blanc” with a smooth finish. 2008 Grenache, El Dorado County. Medium-light garnet color, showing bright red fruits, a bit of pepper, and a strong spice component. Nice acidity kept the mouthfeel fresh, and the tannins were not obtrusive. 2007 Syrah, El Dorado County. Medium color, complex aromas feature plum and black raspberry, earth/leather, spicy oak, and hints of smoked meat. A mineral streak ran through the clean and lively mouthfeel, and this finished with moderate tannins, very nice. 2008 Syrah, “Okei-san,” El Dorado County. Syrah sourced from Wylie and Fenaughty vineyards, co-fermented with 5% Estate Viognier. Medium-dark color, this had some savory and slightly minty notes along with darker fruit profile than the regular Syrah plus an aromatic “lift” from the Viognier component. More full-bodied and showing more oak than the regular Syrah, this had grippier tannins on the finish. All the elements are there for this wine to be very good, but it needs more cellar time for everything to come together. Comments: I’d tasted one or two wines from David Girard in the past, but this was the first time I’d tried a wider line-up, and the wines were impressive. The “Okei-san” bottling is named to commemorate an early Japanese settler in the area. 2008 Zinfandel, “Hangtree,” Shenandoah Valley, Amador County. Medium color, showing ripe and brambly dark berry fruit along with spice and vanilla/oak. Medium-light weight on the palate, and not very tannic. 2008 Barbera, Shenandoah Valley, Amador County. Medium ruby color, with ripe cherry and vanilla/oak on the nose, fairly smooth in the mouth with less apparent acidity than most Barberas, this also had a smooth finish. 2008 Primitivo, Shenandoah Valley, Amador County. Medium color, with more complex aromas than the Zinfandel – some earthy notes and exotic spices along with black cherry and plum fruit. Medium-bodied and a bit more tannic than the regular Zin. Comments: These wines had a bit more oak on them than I’d prefer, but I did like the distinctive Primitivo. 2009 Viognier, Estate, El Dorado County. Light straw color, displaying apricot, tropical fruit, and citrus, and mild floral undertones. Moderately rich on the palate but with crisp balancing acidity, and a long, tasty finish, quite nice. 2008 Grenache Noir, Estate, El Dorado County. Medium-light purple color, intense aromatics of strawberry, pepper, and touches of spice and earth. Lively mouthfeel with moderate tannins. 2008 Mourvèdre, Estate, El Dorado County. Medium-dark color, with plenty of upfront ripe blackberry and plum, earth, a touch of smoke, and dried herbs. Medium-bodied and not too tannic. 2007 Syrah, “Wylie-Fenaughty,” El Dorado County. Medium-dark purple color, complex aromas of dark fruits, herbs, minerals, with some floral and savory notes. Fairly big on the palate but with good balance and structure, and medium tannins on the long finish, nice. Comments: The wines of Holly’s Hill have been consistently good over the years, and these were no exception. Morse 2006 “Ensemble,” Amador County. 60% Grenache, 25% Mourvèdre, 15% Syrah, mostly estate-grown. Medium-light color, showing mostly red fruits, dried herbs, and a strong vanilla/oak component. Medium-bodied in the mouth, the finish was smooth with only minor tannins. Il Gioiello Montepulciano, Estate, Amador County. Medium dark color, earthy black cherry and plum aromas along with black pepper and undertones of spicy oak. Much livelier on the palate than the “Ensemble” with moderate tannins and a tasty finish, nice. Il Gioiello 2007 “Triumphe,” Amador County. 70% Sangiovese (Brunello clone), 30% Cabernet Franc. Medium-dark color, featuring strong black cherry on the nose along with vanilla/oak and a slight herbal note. Fairly rich mouthfeel with moderate acidity and tannins. Comments: Wines under the Il Gioiello label include Italian varieties, plus Zinfandel and Cabernet Sauvignon, while Morse includes Petite Sirah and Rhône-style wines. The Montepulciano was quite good. 2009 Viognier, Estate, El Dorado County. Light straw color, displaying a nose of peach, spice, and some lees notes. Rich mouthfeel with good balancing acidity, and a smooth, clean finish. 2008 Grenache, Estate, El Dorado County. Light garnet color, with red fruits, some spice, and a dash of pepper on the nose. This could have used more structure, and seemed a bit soft in the mouth and on the finish. 2008 “Fleur de Montagne,” El Dorado County. 40% Grenache, 30% Syrah, 20% Mourvèdre, 10% Cinsault. Medium color, this featured a nice combination of both red and black fruits – black raspberry showing most prominently – with baking spices and pepper in supporting roles. Medium-bodied and lively on the palate, this was quite tasty but had very aggressive tannins that will some need time to mellow out. 2006 Reserve Cabernet Sauvignon, Estate, El Dorado County. Medium-dark color, with black currant, herbs, and olive aromas along with oak undertones. Good structure in the mouth, with fairly big but not harsh tannins on the finish. 2007 Syrah, “Red Rock Ridge,” Estate, El Dorado County. Medium purple color, mildly floral notes combined with plum, black cherry, and earth aromas. Medium-bodied with nice acidity, and moderate tannins. 2006 Zinfandel, “Old Clone,” El Dorado County. Medium color, showing lots of black pepper along with bright raspberry and plum fruit and a dash of spicy oak on the nose. Medium weight with a very lively mouthfeel and refined tannins, very nice example of El Dorado Zin. Comments: A solid group of wines from one of the Sierra Foothills' most noteworthy producers over the years. 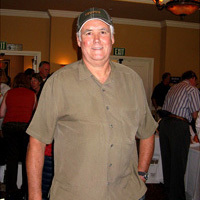 Owner/winemaker John MacCready was on hand to pour his wines. 2009 Viognier, Estate, Calaveras County. Light color, with aromas of stone fruit, lees, and minerals. Crisp acidity and a lively mouthfeel and finish. 2009 Vermentino-Viognier, Estate, Calaveras County. Light straw color, pear and ripe apple, spice, and minerals, plus a delicate floral note on the nose. Medium-light weight on the palate with a clean and refreshing finish, nice. 2007 Syrah, Estate, Calaveras County. Medium purple color, with plummy fruit, along with dried herb, a touch of grapefruit, and some oak in the background. Showing very bright acidity in the mouth, and moderately grippy tannins – could use more bottle age to mellow out this wine. 2007 “Mélange de Mère,” Estate, Calaveras County. 50% Cabernet Sauvignon, 40% Syrah, 10% Petit Verdot. Dark color, aromas of plums and darker berry fruit, dried herbs, and some spicy oak in support. Lively on the palate and medium tannins on the finish. Comments: A nice group of wines from a producer that was completely new to me. The whites in particular were very good. Terre Rouge 2009 Grenache Blanc, Sierra Foothills. Very light straw color, with green apple and pear aromas along with a big spice component. Medium-light weight with moderate acidity, this had a very smooth and tasty finish, nice. Terre Rouge 2008 Vin Gris d’Amador, Sierra Foothills. Saignée of 46% Grenache, 39% Mourvèdre, and 15% Syrah. This dry Vin Gris had a light pink/salmon color, with a fruit-forward strawberry and grapefruit nose, along with a touch of spice. A round mouthfeel led to a smooth finish. Easton 2008 Pinot Noir, Duarte-Georgetown Vineyard, Sierra Foothills. From four clones, with 50% whole-cluster fermentation. Medium-light color, showing ripe plum and black cherry fruit, with loads of spice along with oak undertones. With moderate weight in the mouth, this seemed like it could use some bottle age to smooth out. Easton 2006 Zinfandel, Estate, Shenandoah Valley. Medium color, with ripe and spicy berry fruits, and a supporting touch of vanilla/oak. Lively mouthfeel with tannins that sneaked up on the finish. Terre Rouge 2006 Syrah, DTR Ranch, Fiddletown. Medium-dark purple color, intense aromas of blackberry, minerals, a touch of smoked meat, and a hint of mint. Big and mouthfilling but nicely balanced, this finished with moderate tannins. 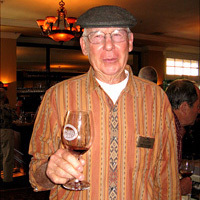 Comments: Bill Easton was pouring his wines at the event. The Grenache Blanc (I believe this may be their first bottling of that variety) and the DTR Ranch Syrah were standouts. 2007 “Noceto” Sangiovese, Shenandoah Valley, Amador County. This is the winery’s “basic” Sangiovese bottling. Medium ruby color, pretty cherry aromas with some spice and oak in the background. Medium-light weight in the mouth, good acidity, and a clean finish. 2007 “Riserva” Sangiovese, Shenandoah Valley, Amador County. Slightly darker color, with a similar aromatic profile to the regular Sangiovese bottling, but with a noticeable step up in intensity. Somewhat richer mouthfeel as well, but with exceptional balancing acidity to keep it lively, and a long, clean finish, very nice. 2007 “Dos Oakies” Sangiovese, Shenandoah Valley, Amador County. Medium color, this displayed riper fruit than the “Riserva” and didn’t seem as expressive. Moderately rich on the palate, with some bitterness on the more tannic finish. 2007 “OGP” Zinfandel, Shenandoah Valley, Amador County. Medium purple color, classic ripe raspberry / boysenberry Zin fruit with an unusually brambly character. Ripe but not jammy, this was medium-bodied in the mouth, with moderate acidity and tannin. 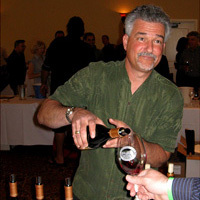 Comments: Vino Noceto consistently produces some of the best Sangiovese in California. Their “OGP” Zin is sourced from the Original Grandpère Vineyard, which contains what are reputedly the oldest Zin vines in the state.